Your full-service partner for innovative merchandising solutions that drive results. We are a nationally recognized leader in point-of-purchase design, print, manufacturing and distribution. We also offer a broad array of execution services that guarantee your message is delivered effectively to your customers. With the highest level of partnership, we deliver innovative merchandising solutions and value-added services that help our clients communicate value propositions to their customers. Our clients spark innovation. We develop new products & services to address the unique challenges of our clients. We build and execute merchandising success stories. We understand our clients' needs and deliver customized merchandising solutions that drive results. We help our clients achieve market leadership with custom-tailored merchandising that disrupts the marketplace. A core product of S2K. 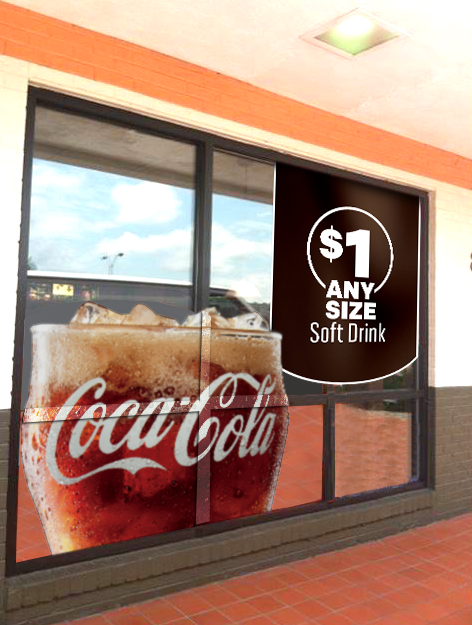 Leverage the full power of your retail location with our three window wrap programs: One-Size Fits All, Multi-Size, and Custom. Available in a variety of formulations. This product includes interchangeable panels that allow for mid-promotional updates while ensuring the continuity of sustaining your messages! Stable, saves space, reusable and easy to store! Our high-impact 3-D window graphics are perfect for any promotion, and can be used in conjunction with our Window Wrap programs. Very durable, affordable and proven to improve sales by 23.6%. For more than 25 years, we have developed a wealth of experience working with the biggest foodservice and retail chains. The combination of our innovative products, services and value add-ons has delivered a solid roster of clients over the years.